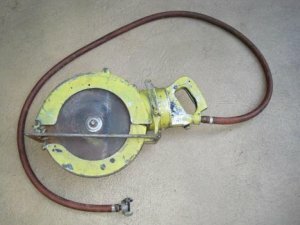 Antique tool collectors might be interested in this rare WW2 era pneumatic (worm drive?) Skil Saw. Some of you older tool users may have heard folklore about such a tool, and maybe a rare few have even seen this mystical tool in person. The idea of a pneumatic circular saw with a huge 12-inch blade seems impossible, but maybe that is because we don't live in an age where tool companies would take a chance on a crazy tool idea. The Model 2127 seems like it would be impractical for most application, which probably lends to its rarity, but tool collectors don't care about practicalities when they come across something like this. This saw can be yours for the low price of $999. I did find an old Craigslist post of the same model 2127 saw and it was much lower at $350, but who knows if these are the last two Model 2127 saws left in the world.